Practice makes perfect halfway decent - Stop staring and start sewing! I've had a hankering to do some embroidery lately but, like anything, it's good to practice a little when you're rusty. It's not like riding a bike (at least for me). It's more like a use-it-or-lose-it kind of thing. 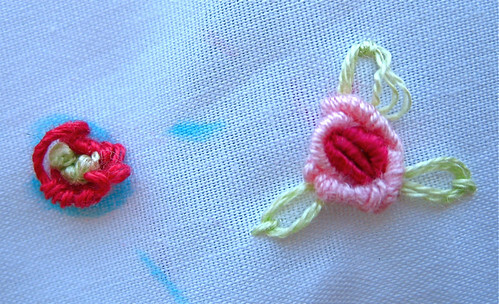 The first one (on the left) was awful because I realized, after the fact, that I needed a better needle and the floss I was using was some cheap stuff from a kit so the bullion stitch wouldn't slide through easily. It wasn't soft and smooth like the DMC floss and it made a huge difference. By the time I did the one on the right I was getting the hang of it again. 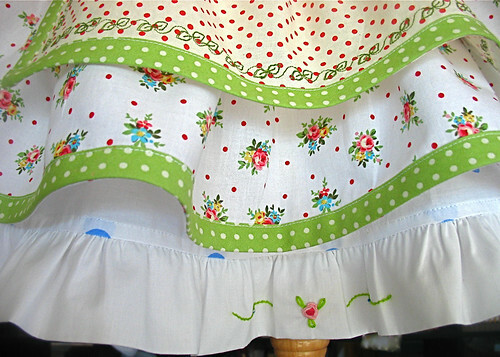 Here's the next one I did for the ruffle on this skirt. I think it turned out sweet! I also did some cute little french knots on the green "vines" but unfortunately you can only see a hint of them (but they're really cute, take my word for it). And I was so shamed by my friend Kelci's post about using the fancy stitches on her new machine that I decided to try some of my own (seeing as I've had my machine 2 months longer than her!). I'm so tickled with the results! 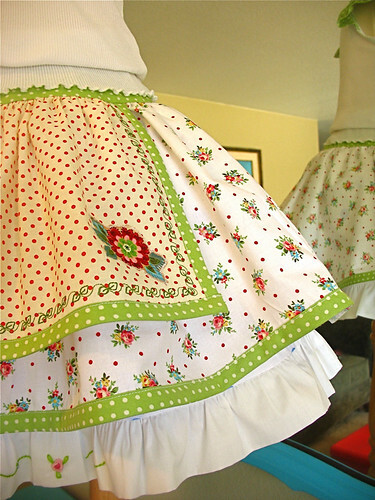 Look at the little apron! It so weird watching the machine do all that pretty work in such a perfectly straight line. Here's the whole outfit (Holy smokes! It already has a bid! No way!). I added these cute sleeves to the tank top (more machine embroidery!) and it was so easy I will take pictures of the process next time because I think it's a great way to add some "flare" (or is it "flair"?) to a plain little top. Thanks for the nice comments on the girls Easter outfits. I promise to get some full length pictures up soon. 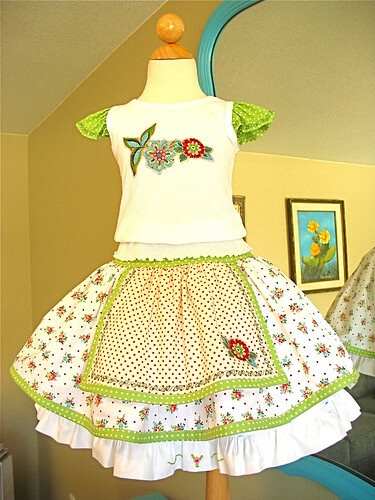 Oh, and I just put in a nice order with Free Spirit for some more delicious fabrics!! Yippy! And Sandi's Ginger Blossom fabrics are really flying out the door so don't wait to long to get some!